VB native Pharrell Williams has released the lineup for his upcoming concert event “Something in the Water”. The event will take place at the Virginia Beach waterfront on April 26, 27 & 28. The 2019 season is being dubbed “a transition year,” by Beach officials. It will still be part of the traditional College Beach Weekend, but will act as the hub for social activity. College Beach Weekend has been marred by violence in the past. William’s event is meant to create a more fun, positive vibe for College Beach Weekend. Tickets for the festival will go on sale Friday at noon and can be purchased at somethinginthewater.com according to a news release from Live Nation, producer of the festival. The ESSWCD Conservation Poster Contest is open to all local students, grades K-12. Cash prizes will be given for 1st-4th place in each of the five grade categories: K-1, 2-3, 4-6, 7-9, and 10-12. This year’s theme is “Life in the Soil: Dig Deeper”. Posters must have this year’s theme somewhere on the poster. Posters must be submitted to ESSWCD by Friday, April 5, 2019 with a signed 2019 Conservation Poster Contest Entry Form attached to the back. Winning posters will be on display and awards will be given during the ES Science Fair held on Saturday, April 27, 2019 at the Eastern Shore Community College. For entry forms, complete rules and tips on how to make an effective poster, contact Mary Melson at mary.melson@esswcd.org or (757) 302-4433. This will be the 43rd year the Virginia Association of Soil and Water Conservation Districts has sponsored a week long summer conservation camp for Virginia high school students on the campus of Virginia Tech, Blacksburg, VA. Applicants must be in grades 9-12 during the 2018-2019 school year. Twelfth graders who graduate in May, June, July or Au-gust are eligible to attend. Campers that have previously attended cannot attend for a second time. This year the camp will be held July 7-13, 2019. The program brings together students from across the State for a week of learning about Virginia’s natural resources from conservation professionals and faculty at Virginia Tech. Most of the instruction is hands-on and outdoors. The Eastern Shore Soil and Water Conservation District and Ye Accawmacke Garden Club are offering scholarships to send two Eastern Shore high school students to Youth Conservation Camp. During the week-long camp, campers will learn about lake ecology, fisheries management and stream morphology through hands-on experiences. There will be tours of the Forest Products Center, Swine Center and Veterinary Teaching Hospital. If hiking to the Cascades Waterfall, tree identification, swimming, fishing, insect identification and canoeing sound like something you would enjoy, then this camp is for you! Apply by Friday, April 12, 2019. Please direct all camp related questions to Mary Melson at (757)302-4433 or mary.melson@esswcd.org. 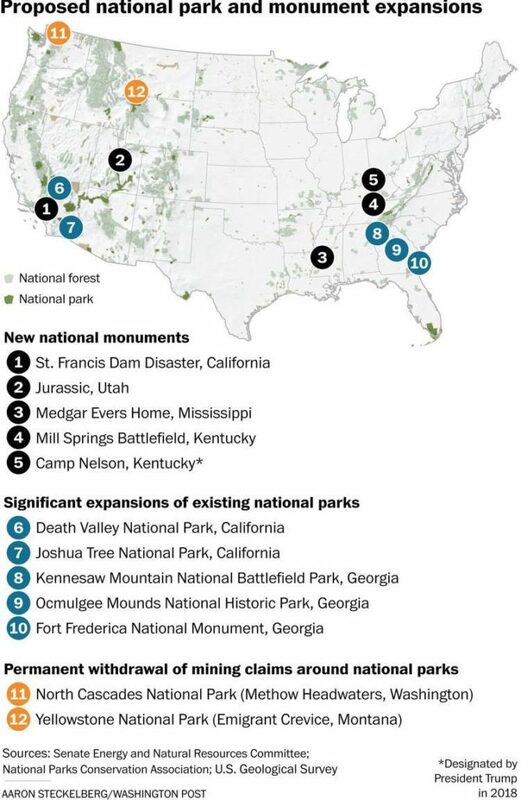 The Washington Post reported this week that the Senate voted 92-to-8 on Tuesday to approve a bill that designates 1.3 million acres of newly designated as wilderness, 370,000 acres just outside two of the nation’s national parks. 620 miles of river in seven states would be protected from damming and development, and more than 380 species of birds would see their habitats protected through 2022. The Congressional Budget Office predicts the legislation would wind up saving money for taxpayers. The White House has signaled support. The legislation would create a federal program that funnels offshore drilling revenue to conserve a spread of sites that includes major national parks and wildlife preserves, as well as local baseball diamonds and basketball courts. “It took public lands to bring divided government together,” said Sen. Steve Daines (R-Mont. ), who partnered with his Democratic counterpart Jon Tester to permanently block mineral extraction from 30,000 acres of U.S. Forest Service land right outside Yellowstone National Park. After a few weeks off, the Taqueria Truck at the El Ranchito mexican store in Cheriton will be opening back up. Adivinen quien volvera a abrir a partir de la semana que entra ? La taqueria Los mantendre al tanto de el dia exacto!! Check their Facebook Page to find out the exact day. Scientists estimate that more than 8 million metric tons of plastic are entering our ocean every year. There could be more plastic than fish in the ocean by 2050. From tiny plankton to enormous whales, countless animals across marine ecosystems are affected by plastic pollution. It’s found in 59% of seabirds like albatros and pelicans, 100% of sea turtle species, and over a quarter of fish sampled from seafood markets around the world. Marine debris isn’t an ocean problem…it’s a people problem. Don’t use plasticware at home and be sure to request restaurants do not pack them in your take-out box. Ask your local grocer to take your plastic containers (for berries, tomatoes, etc.) back. If you shop at a farmers market they can refill it for you. Dutch inventor Boyan Slat founded The Ocean Cleanup at the age of 18 in his hometown of Delft, the Netherlands. The Ocean Cleanup is designing and developing the first feasible method to rid the world’s oceans of plastic. Every year, millions of tons of plastic enter the ocean. A significant percentage of this plastic drifts into large systems of circulating ocean currents, also known as gyres. Once trapped in a gyre, the plastic will break down into microplastics and become increasingly easier to mistake for food by sea life. Going after it with vessels and nets would be costly, time-consuming, labor-intensive and lead to vast amounts of carbon emission and by-catch. That is why The Ocean Cleanup is developing a passive system, moving with the currents – just like the plastic – to catch it. The system consists of a 600-meter-long floater that sits at the surface of the water and a tapered 3-meter-deep skirt attached below. The floater provides buoyancy to the system and prevents plastic from flowing over it, while the skirt stops debris from escaping underneath. As the system moves through the water, the plastic continues to collect within the boundaries of the U-shaped system. In preparation for full-scale deployment, The Ocean Cleanup organized several expeditions to map the plastic pollution problem in the Great Pacific Garbage Patch to an unprecedented degree of detail. The team simultaneously advanced its design through a series of scale model tests, including prototypes deployed in the North Sea 2016, 2017 and 2018. The first cleanup system was deployed from San Francisco Bay on September 8, being towed to the Great Pacific Garbage Patch to commence the cleanup. The Ocean Cleanup, launched the world’s first ocean cleanup system from the San Francisco Bay in September. The cleanup system (“System 001”) is heading to a location 240 nautical miles offshore for a two-week trial before continuing its journey toward the Great Pacific Garbage Patch, 1,200 nautical miles offshore, to start the cleanup. System 001 is being towed from the San Francisco Bay by the vessel Maersk Launcher, which has been made available to the project by A.P. Moller-Maersk and DeepGreen, its current charter holder. As the continued battle for the life and future of Northampton County continues to be played out over the update to the county’s comprehensive plan, across the bay in Chesapeake, a scenario that could be our future, is taking place right now. It pits developers against residents who want to hold on to the the last remaining vestiges of open space and farmland left in southern Chesapeake. CHESAPEAKE, Va. (WAVY) — Thousands of acres of farmland are closer to becoming the home of a “mega-site’ that proponents debate could help bring jobs to Hampton Roads. While the move doesn’t officially rezone the property, it does allow owners of the Frank T. Williams Farms property to begin to market it for a potential Coastal Virginia Commerce Park. Over the summer, Kevin Cosgrove, representing the Hampton Roads Chamber and Chesapeake’s Economic Development agency, proclaimed the “shovel ready” piece of property will help Chesapeake and the region to diversify its economy. The lack of “shovel ready” properties was pointed to marquee issue when 10 On Your Side highlighted the region’s business climate struggles. Prior to the vote on Tuesday, Cosgrove again stood in front of council again to endorse the move. However many community members didn’t see it that way at all. “This proposal is a direct attack on Southern Chesapeake,” said resident David Schleeper. He joined many concerned about increased traffic and environmental impacts on the longtime rural community. “At the rate we are going there is not going to be anything left,” said Kimberley Hoke, with the group Stop Developing Southern Chesapeake. Following the meeting, Mayor Rick West looked to calm fears, noting nothing is a done deal. “This was simply a move to say we’re going to play, it doesn’t mean that we we have a game, it doesn’t mean that we have an offer, it just means that we are open for business,” West said. The site remains farmed at the current time. AP -Conservationists in Virginia and Maryland say a Trump administration proposal could undermine efforts to clean up the Chesapeake Bay. The measure would roll back federal protections for certain waterways and wetlands. It would specifically impact “ephemeral” streams, which flow after a rainstorm or snowmelt. Also under threat are isolated wetlands that experts say help to filter pesticides and fertilizer from nation’s largest estuary. An Obama-era rule protects those particular streams and wetlands and restricts some farming on land that sits near them. Critics say the rule forces farmers to hire expensive consultants to figure out which land they can use.